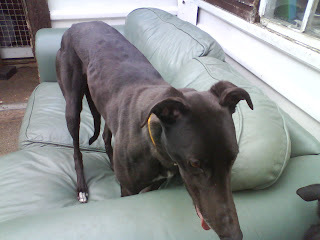 In June 2010 we adopted a beautiful greyhound from Solihull's Daybreaks Kennels. My mom, after wanting one for quite a while after our amazing mongrel Pippa died a few years ago, finally took the plunge and we went to visit again, but this time, with rehoming in mind. As luck would have it, we arrived a bare hour after a lovely, friendly little black ex-racer arrived, straight from her last race. 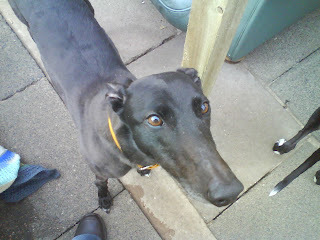 We fell in love with her on first sight; no need to go look at the others. We decided straight away she was the right one for us; all so excited to be picking her up in one week. 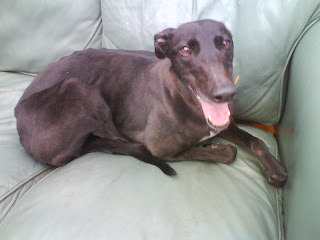 The people at the RGT were all so helpful, and happily informed us of their joy to be seeing the back of the dog that made that made their ear drums bleed ;) Luckily for us, she hasn't made much of a racket since.